To get started on small animal agility, gerbil agility, hamster agility, mouse agility, rat agility, rabbit agility or any other small animals, you can use a number of item around your home as props and equipment pieces. Just make sure it is the right size and stable enough to hold the weight of the animal you are working with. I have seen a very large, elaborate, mouse agility course that was made almost in whole out of cardboard boxes cut into all sorts of agility pieces. Mice are very light weight. If you were doing this for a gerbil or hamster the items would have to be a bit more sturdy. Below are ideas of items you might start with when training....more will be added soon. We are working on this site frequently....so please check back often. Pencils, rulers, dixie cups and toilet papers rolls will get you started training gerbils and hamsters and mice. While a full sized hamster may need a wider platform, a gerbil, dwarf hamster and or mouse could sure use a ruler glued to for a Balance Beam. To get started you do not need the Balance Beam far off the ground. The possibilities are endless for a Hoop Jump for animals this tiny. You can do many different things with cardboard boxes. For a Window Jump you could cut a hole, just about 4" for a gerbil, in the side of a small box about 3" up from the bottom of the box itself. Just make sure the box you chose is stable enough to support the gerbil's weight. Toilet Paper, Paper Towel Rolls after they have been emptied. The thing is, if you give these items in the gerbils cage you will have a hard time training them to just run through these. All but a large hamster or a large gerbil will be able to use a toilet paper roll for an Open Tunnel. 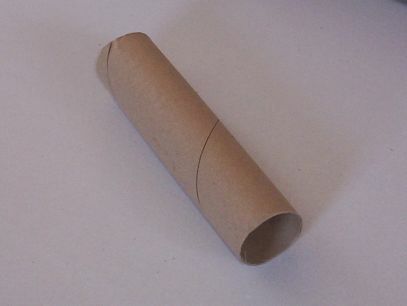 The toilet paper rolls are a good start too because they are short....the little animals love to go into the Tunnels, coming out is where you have to train them. 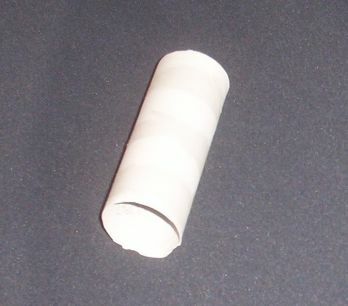 A Christmas wrapping paper roll is a little thicker or has a bigger hole. Cute off several inches for the bigger animals, and there you go...an Open Tunnel. Paper Towel rolls are also good. These can even become Sea Saw Tunnels. Make sure your small animals knows how to use both the Tunnel and the Sea Saw before training for the Tunnel Sea Saw. Another idea, especially when first starting is an empty round oatmeal box with the ends cut out. Cut a small box so that you have a short square (rectangle) that the gerbil could run through. It will need to be long enough to stand and stable enough to hold a piece of fabric. Cover this with a small piece of fabric. You can just drape the cloth or you could tape it to the box all the way around so that it stays put for much use. You can use many items to make Weave Polls. 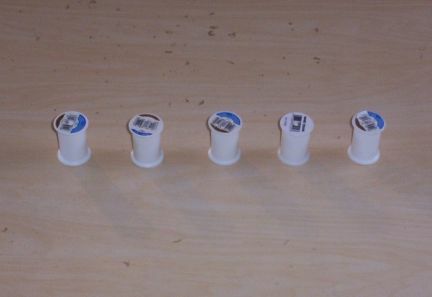 This is a row of thread spools lined up and ready to be run by a gerbil, hamster, mouse or even a dwarf hamster. You can use a hard cover book on it's side with a pencil under it for starters. Do not use a book that you would care if it were urinated on...get an old book. Thje list is endless of what one might use for a Pause Table for an animal as small as these. I like this one. It is small enough for easy storage, easy to clean and large and stable enough for a gerbil, hamster, dwarf hamster, a mouse or the like. It comes with two Stationary Bar Jumps, one with two bars the other with three bars, a Triangle Hoop Jump, an A Frame, an Open Tunnel and a Closed Tunnel. Great for using to make videos for YouTube. Most of these questions would or could be answered for all or each small animal species. If you spend time with any of your small animals, Gerbils, Rats, Ratties, Rabbits, Hamsters, Mouse, Mice, or any other animals, you will find you will bod and training becomes easier. If you are working a rat, gerbil, hamster, mouse or a rabbit, we do have full websites with information at www.theagilerat.com www.hamsteragility.com www.mouseagility.com or www.fancyratagility.com and www.rabbitagility.com come take a look. HOW HARD IS IT TO TRAIN GERBILS TO RUN AN AGILITY COURSE? Well? LOL That depends largely on the animal and the trainer. If you have trained dogs or cats or any type of animal you are "one up" on someone that has never trained before. If the animal is healthy and is bonded to the owner that will also make a huge difference when training Agility. Does your small pet love treats? This too may also may help in your training. All in all, it is not too hard to teach a gerbil to run an Agility course. If you are consistent and fair with the animal, it will come relativity easy. Think of it like this.....if someone came to you and spoke a foreign tongue and was trying to teach you something what would it take for you to understand? Work your gerbil with that same perspective. I have honestly seen humans talk louder to a animal thinking, I guess, that the animal would understand better if it were just a bit louder. LOL Now you understand what I am saying, ey? Animals can and do learn words we teach them. Words, not paragraphs. Keep commands in words and use the same word consistently. Something I have noticed with the average person when they train a dog....when they tell the dog "down" it might mean, "get off me" and another time it might mean to "lay down" and another time it might mean to "get off the couch". Now, most dogs can understand, but it takes longer. For instance, if you use the same word "down' for all three commands heres what might happen....you come in and the dog is sitting on the couch. You say "down" and the dog lays down on the couch and you get mad at the dog for not getting off the couch......who is in the wrong here? LOL Keep the same word for the same action you want and use it each and every time. HOW DO I GET STARTED WITH MY GERBIL AND GERBIL AGILITY? First and foremost, start with a healthy gerbil that is bonded to you. One that comes when it is called or at least follows your finger on a table. If your gerbil is not bonded or in fact even tame, that is where you begin. Spend a few times each day, a minimum of three times a day, just gently holding your gerbil. Once your gerbil starts trusting you and looking forward to you coming to it's cage for more then just feeding it, then you can begin with further training. I HAVE MORE THEN ONE GERBIL, CAN I START BOTH OF THEM TOGETHER? Yes, but let's clarify "together". Train each animal, one at a time, with the other in a holding cage set up where it can see the other gerbil or small animal being trained. You may actually have more success training like this then someone training only one gerbil off and by itself. Animals actually learn from watching other animals learn or doing something. Mind you, gerbils not so much as a dog or cat or rat....but it might just work for you. HOW OLD DOES A GERBIL HAVE TO BE TO PARTICIPATE IN GERBIL AGILITY? My opinion is to start with a young gerbil. Younger gerbils are often more agile and adventurous then older animals. Younger gerbils are not yet "set in there ways" as an older one can be. That said, what is old? If you have an adult gerbil and you are bonded to that animal, if it is not elderly, go ahead and give agility a try. If you do not know the age of your animal, but it is an adult, you may not want to do too much or too many jumps. WHERE CAN I GET AGILITY EQUIPMENT? 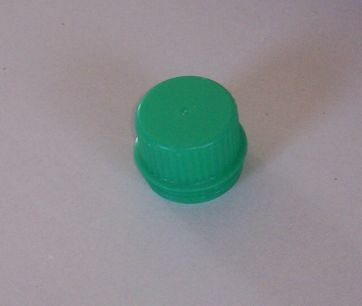 Most people make their own Small Animal Agility Equipment. 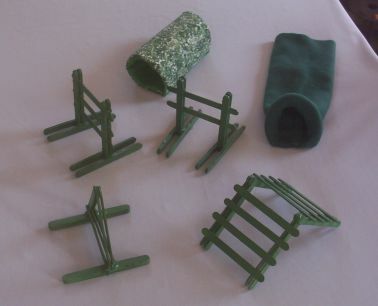 We do make and sell Agility sets and agility pieces here at our site. We make and sell different sizes for the different species. Check often as we come up with new ideas and different pieces frequently....what was sold yesterday, may be replaced today with something you will like even better. You can also use "make shift" equipment with items around your home. See our Getting Started page for ideas. Just make sure what ever equipment you chose it is safe and stable for your animals. I recommend you spend time with your gerbil a few, at least twice, every day. You do not have to be training each time, just spending time with your gerbil. I highly recommend that if you have an event coming that you spend at least 10 per day training or readying your pet for the event. An event can be competition, an organized training session with friends, a demonstration you are putting on for a local school, church or other organization.....or, even if you are just going to show off for your family and or friends. The more time you spend with your gerbil, the more time you and your gerbil will want to spend together. WHAT PIECE OF EQUIPMENT SHOULD I START MY GERBIL ON? The truth is, it does not matter. I do however highly recommend that you start with an easy piece such as a smaller Jump or a low, wide Balance Beam. Keep working with the same piece until your gerbil "gets it" and manipulates it correctly, getting on and getting off in the right manner at the same end of the piece each time. After your gerbil has learned the first piece well add another piece behind this first one. Work the gerbil in a continuous matter. In other words have the gerbil do the first piece then do not reward until it does both pieces....piece one then piece two, then reward. After the gerbil has learned to run two pieces well and correct add a third piece and so on until you have your full course set up. HOW MANY PIECE OF EQUIPMENT MAKE A FULL COURSE? It depends on what you are doing at the time. Is this a training event? Has the gerbil learned to use each piece of the course? Is this a Competitive Event? In training you may use as many or as few as you like. In an event the amount and what pieces would be set by the event giver. For novice classes usually five pieces are used. It can go up from there. It also depends on how many pieces of equipment are available for use. Do you own one piece or 20? Gerbils are smart and with good training and for a good treat many will run the course no matter how large it is, within reason of course. MY GERBIL HAS LOST INTEREST IN TRAINING, WHAT DO I DO? Change your training technics. If you train on the same table the same course the same direction each time your train (and I recommend this to start) change the side of the table you stand on, change the course, mix up the pieces of equipment so that it is a new course for the gerbil to run. Bring new and tasty treats. Make a bigger fuss over your gerbil as it preforms. Just make it fun for the animals. Many times if you start a new gerbil, while the gerbil you were formally working daily watches, it will refresh the oldster to want to "play" again. Many times too, it will help both gerbils, watching one another to do better when running the course. (This is true with all animals including human children). THERE IS NO ONE IN MY AREA DOING AGILITY THAT I CAN FIND. Maybe not, but I bet if there are other small animal owners they would be interested in learning more about gerbil or other small animal agility. You might want to start a group. I did this in WI by just setting a date at a park and inviting friends that had rabbits and rats to join me there for the fun. I took the equipment I had and we had a ball. We met twice a month and ate out, dutch treat, after the event. Some evenings we had as many as 14 people that participated. For the first few times at these training events you will need to "host" them. Welcome each person as they come, take notice of their animals, introduce people as they come, set up the table before others get there, be a host. Join eLists to find folks in your area that own small animals. You may be surprised that if you befriend a hamster owner, you may own a hamster soon too and they might be owning a gerbil. WHY DO SOME PEOPLE CALL THE AGILITY EQUIPMENT "FENCES"? Some people, mostly in the UK and Sweden call the equipment pieces fences because all small animal (including dog and cat) agility ideas came from horses in Steeplechase or Horse Show Jumping. Steeplechase or Showjumping is set up as an obstacle course with many types of fences for each of the horses to jump in a timed competition. Dog Agility came next and so people called the jumps fences for quite sometime. When it came to rat agility many people continued calling the equipment fences, even the the tunnels may be called fences. WHAT IS THE DIFFERENCE BETWEEN AN AGILITY COURSE, AN OBSTACLE COURSE AND A MAZE? An Agility Course has equipment on it that the animal will maneuver over, under around and trough. A Maze and or obstacle course are usually a "puzzle" set up out of cardboard or wood with high walls and dead end halls that the animal must get through for a treat at the end. I HAVE HEARD THAT OTHER SMALL ANIMALS ALSO DO AGILITY, IS THAT TRUE? Yes, that is true. Many small animals, gerbil/gerbils, hamster/hamsters, mouse/mice, guinea pig/pigs as well as rabbit/rabbits also do agility. Each species has their own size equipment. Each species is a little bit different, but one thing is the same in training them, the tighter the bond, the more time spent training them, the better they will do at agility or trick training. We have other web sites you can see in the menu at the right. Have a look, you may just find a new hobby for you and your small pets. You alone are responsible for training your animals. Any training you do with your animals is your responsibility. We only tell of what has worked for us with our animals. We can not and will not except responsibility for something so far out of our control, people we do not know, training, who knows how, with animals we have never seen. PLEASE JOIN US ON A YAHOO GROUPS ELIST CALLED THE AGILE RAT AND OR SMALL PET TRICK TRAINING. THEY ARE A FRIENDLY GROUPS AND WE LOVE TO HEAR ALL ABOUT YOUR SMALL ANIMAL TRAINING AND GENERAL CUTE STORIES STORIES. YOU CAN LEARN MORE ABOUT SMALL ANIMAL AGILITY TRAINING AND EVENTS, MEET OTHERS THAT ARE TRAINING AND ASK ANY QUESTIONS ABOUT CARE AND OR TRAINING SMALL ANIMALS OR ANY THING ELSE YOU MIGHT WANT TO KNOW.